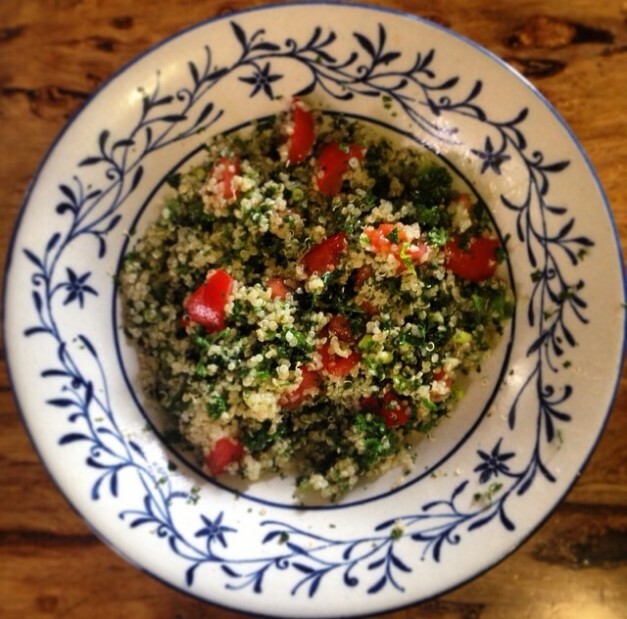 Tabbouleh is a great salad or side to have for dinner or lunch. This version uses quinoa in place of the traditional ingredient burgul which is cracked wheat . Quinoa is a seed, it is generally well tolerated by those with digestive issues. The combination of parsley and tomato is great to help boost iron and vitamin levels. Wash quinoa under running water. Place fresh water into saucepan, once boiling add the washed quinoa, cover and cook until tender and water has almost evaporated. Wash and dry parsley and chop finely, once quinoa is cooked add to parsley with diced spring onion. Mix lemon juice with oil and season. Dice tomato and add with dressing just prior to serving.